Apple AirPort Extreme is the wireless networking router that allows users to surf the Internet from almost anywhere of your home, office, business, or schools, and able to provide Internet access to multiple or group of users without installing expensive and messy cabling. Apple AirPort Extreme 802.11n WiFi wireless base station supports 802.11a/b/g wireless protocol and draft 802.11n new high-speed wireless technology, with frequency band of 2.4GHz or 5GHz. 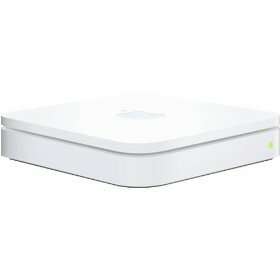 Apple AirPort Extreme features support for NAT, DHCP, PPPoE, VPN Passthrough (IPSec, PPTP, and L2TP), DNS Proxy, SNMP, Wi-Fi Protected Access (WPA/WPA2), wireless security (WEP) configurable for 40-bit and 128-bit encryption, MAC address filtering, NAT firewall, support for RADIUS authentication, 802.1X, PEAP, LEAP, TTLS, TLS, FAST and time-based access control. AirPort Extreme comes with 3 10/100BASE-T Ethernet ports and USB port, and supports AirPort-enabled and AirPort Extreme-enabled Mac computers, as well as Windows PCs with Wi-Fi certified 802.11b cards installed. Pocket-lint reviews Apple Airport Extreme 802.11n Wi-Fi Wireless Base Station and concludes with score of 9 out of 10 that over the previous edition this is a massive improvement, however it’s disappointed that Apple hasn’t put the 3.5mm jack as found on the Airport Express so you can stream your iTunes tracks to a stereo. Other grumbles are the expense, Apple being Apple it’s twice the price of a wireless n router from Linksys, however in its defence the software and installation is incredibly polished. If you’re a die-hard networking fan then this isn’t for you. However if you’re a Mac (or PC for the matter) owner looking for a simple, but highly effective wireless offering for your office or home then this is great. And that USB drive element makes all the difference if you need to share files around your house. TechWorld reviews Apple Airport Extreme Draft N Wi-Fi router and concludes that it has very good set-up and management, fast throughput, dual-band Draft-N implementation, however, it lost some speed by lack of Gigabit support. Buying advice is that Apple’s AirPort Extreme Base Station may have been a long time coming, but it’s worth the wait for anyone whose network needs either greater speed or longer distance. While cheaper 802.11n gateways are already on the market, none matches Apple’s for features or ease of setup. Apple just needs to step up to the plate and add Gigabit Ethernet to fulfill this speed demon’s full potential.